you will see Zone 1 & Zone 2. Click Here to see a map showing these zones. 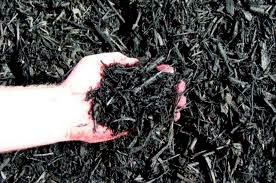 The colorant used to dye mulch comes from naturally occurring oxides, and poses no threat to the environment. The wood used to make the mulch is clean, trimmed lumber from building product manufacturers, or shredded wood from land clearing. The wood is composted before the dye is appled. The colorant easily lasts one season or more. It does require a short drying period after application, usually about 36 hours without rain. The high percentage of wood in the mulch means it will last longer, and is less likely to form a hard, packed, waterproof crust like the cheaper triple-ground mulch has a tendency to do. 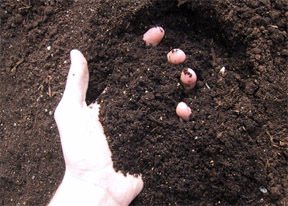 Triple-ground mulches also create a better environment for artillery spore and other fungus to grow, and the triple-ground mulch decomposes much more quickly than the colored mulch. Colored Mulches are available in Black & Brown. * Click Here to determine quantity of mulch needed. This is actual tree bark instead of stump and tree grindings. 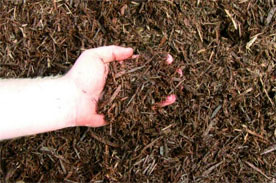 This double shredded mulch is all natural, and is a wonderful top coating in garden beds. 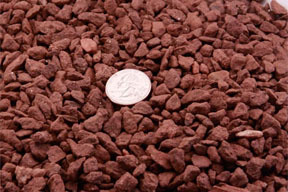 It does not compact as tightly as most triple-ground mulches, and is the old standard in mulch selections, sometimes referred to as tan bark. It will, however, not hold its color as long as the dyed mulch will. 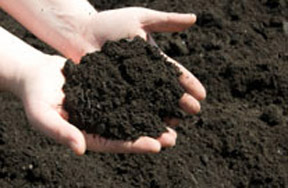 No rocks, roots, or clay in this natural and screened topsoil. 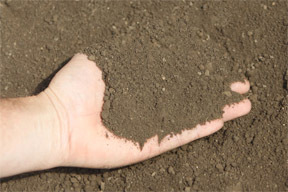 This soil needs no other amendment added before planting, just dump it in your garden, spread it out, and proceed with planting. It is already mixed with just the right amount of mushroom compost to make your plants thrive and provide good drainage in your garden. 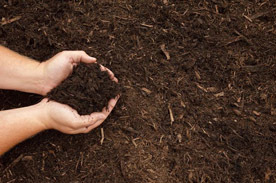 This soil is great for yards, low spots, and for planting trees and shrubs. Super Soil is a mixture of 50% Enriched Topsoil and 50% Leaf Gro Compost. Our FAVORITE choice for compost. Leaf Gro has no objectionable odor as compared to mushroom soil, is less likely to contain weed seeds, and is easy to mix into existing soil. There will be no damaging salt accumulations when using Leaf Gro, like you might see when using mushroom soil. Leaf Gro can be used as a top dressing for lawns, and to amend vegetable gardens and planting beds. It can also be mixed with potting soil when filling pottery or other containers for planting. A 50/50 blend of our enriched topsoil and Leaf Gro is perfect for raised vegetable gardens. Red landscaping stone makes a long lasting, beautiful, low maintenance groundcover to enhance your flower beds. Also makes a nice garden path. $72 per cubic yard, $65/ per two-thirds cubic yard. White landscaping stone too, makes a long lasting, beautiful, low maintenance groundcover to enhance your flower beds. Also makes a nice garden path. $51 per cubic yard. 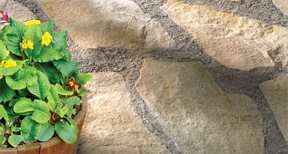 This 3/4" general purpose stone is granite colored and free of any other debris. 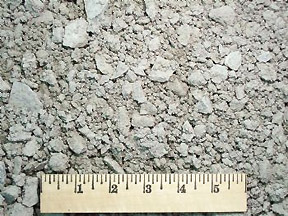 It is generally non-decorative and is used mostly on driveways, for drainage, and under decks. 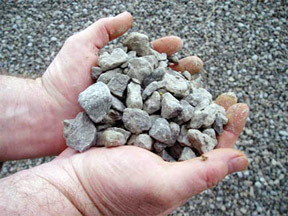 This product contains stone dust and several different sizes of crushed stone. 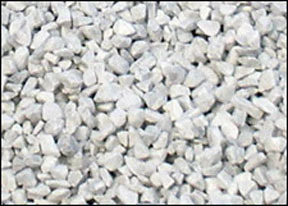 It is used for the base under driveways, patios, and walkways, and also under retaining walls because it packs tightly. This product can be used as a pathway, as a final coating over CR 6 to level patios and walkways, and also for leveling individual stepping stones.